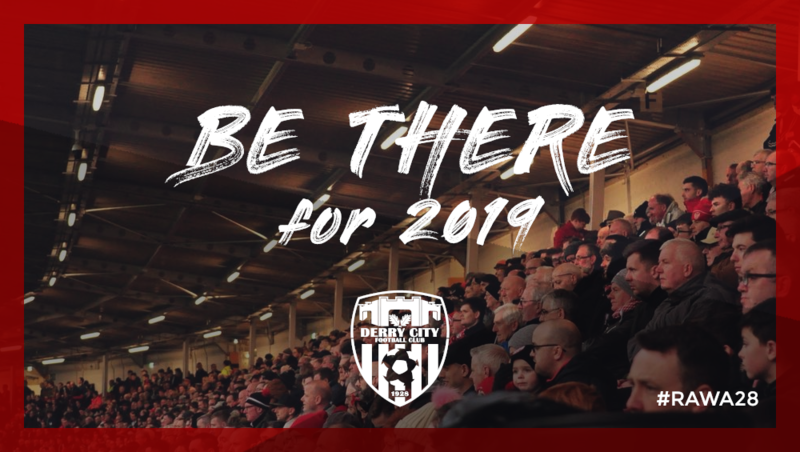 Derry City are pleased to announce details of their 2019 season tickets, which will go on sale next week. Ahead of the sale, we will be holding special “Season Ticket Surgeries” on Monday 19th (10am-2pm) and Wednesday 21st (6-9pm). These office hours are to resolve any issues that season ticket holders may have had with seating(incorrect seating, duplicate seats etc). The aim of this session is to resolve as many of these issues before the tickets go on sale next Wednesday. We strongly encourage anyone to attend this, but if you cannot, please email [email protected] with full details of the issue. Season tickets will go on sale on 21.11.18, with a renewal deadline to retain your existing seat of 15.12.18. 2019 season tickets will go on sale on 21.11.2018 from the Brandywell and online. Ahead of the sale, we will be holding a special “Season Ticket Surgery” on Monday 19th (10am-2pm) and Wednesday 21st (6-9pm). These office hours are to resolve any issues that season ticket holders may have had with seating(incorrect seating, duplicate seats etc). The aim of this session is to resolve as many of these issues before the tickets go on sale next Wednesday. We strongly encourage anyone to attend this, but if you cannot, please email [email protected] with full details of the issue.